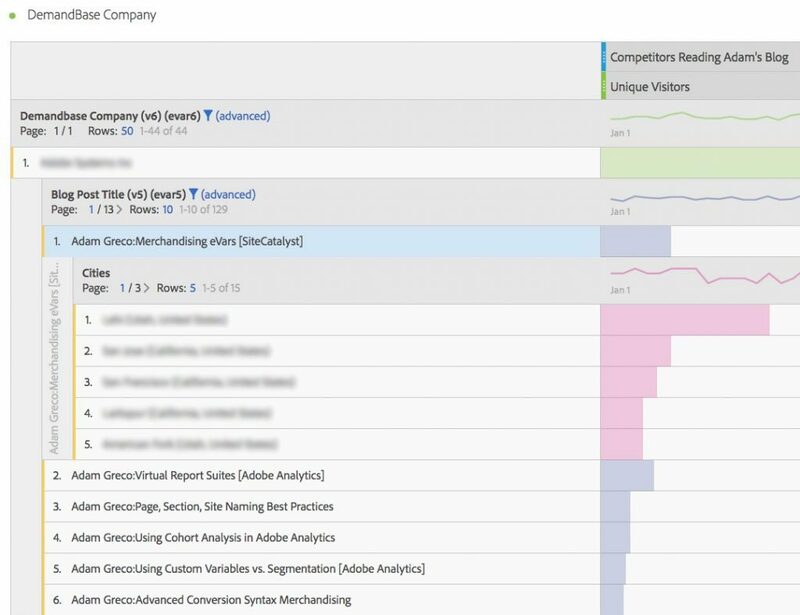 If you are an Adobe Analytics customer, you have probably noticed that they have been tearing it up lately when it comes to Analysis Workspace. There has been a lot of cool innovations and fun stuff for you to play around with in this new freeform interface. Being an “old fogey” myself, sometimes it takes me a while to play around with the new stuff, but I have started doing that lately and found it to be interesting. In this post, I will demonstrate how you can use the new Venn Diagram visualization to do analysis. 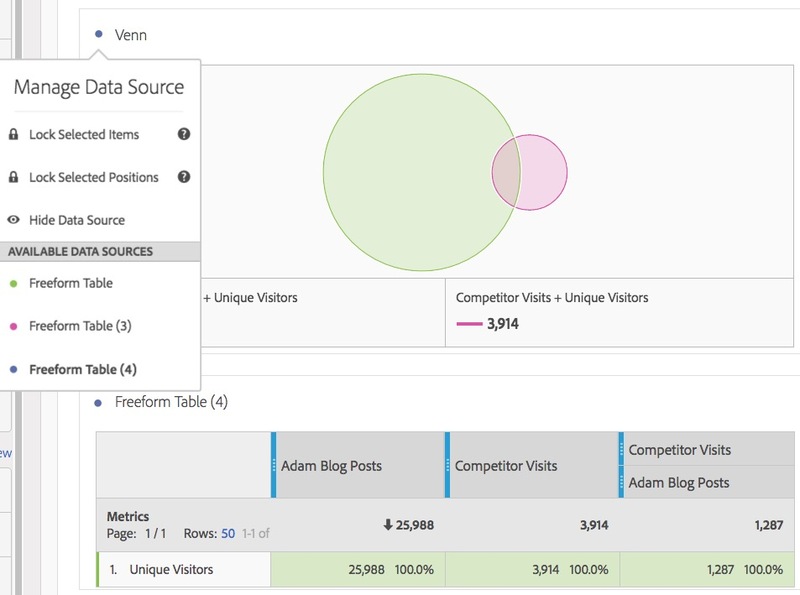 If you are in the analytics space, you probably already know what a Venn Diagram is, but just to be sure, it is a data visualization that allows you to see how much of an overlap there is between data elements. 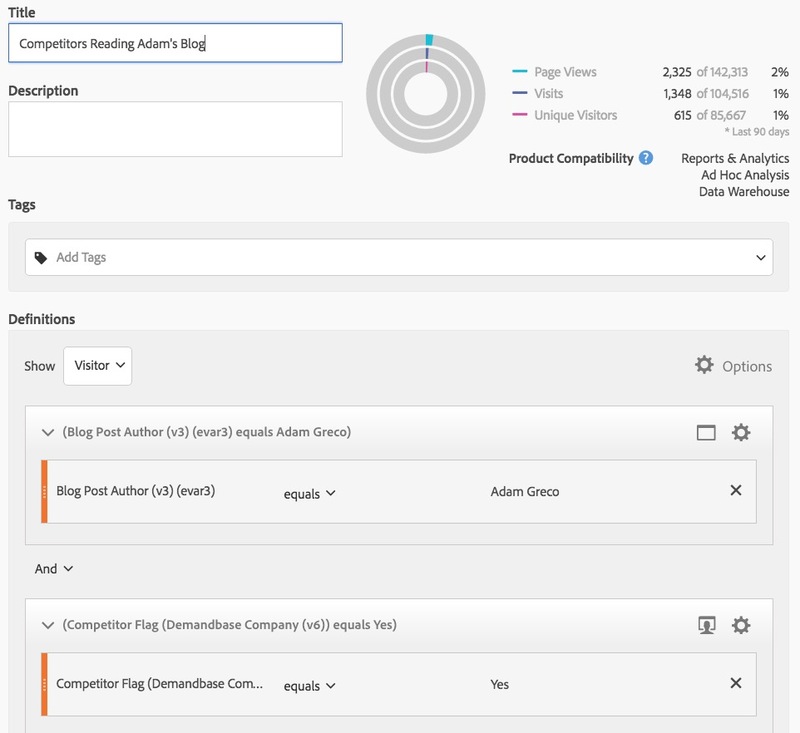 In Analysis Workspace, Adobe allows you to add up to three Segments to the Venn Diagram and then choose a metric for which you want to see the intersection. To illustrate this, let’s look at an example. 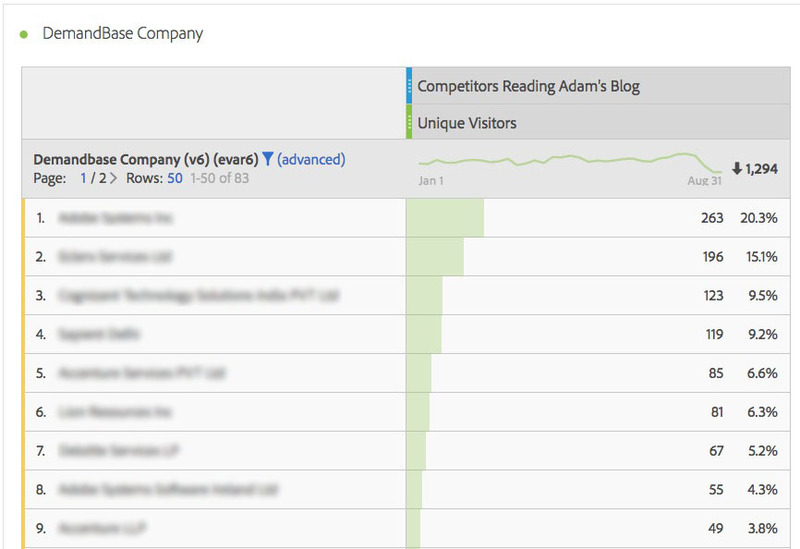 Let’s say that I want to see what percent of visitors to the Analytics Demystified blog view my blog posts and I also want to see how often my competitors are reading my blog posts. 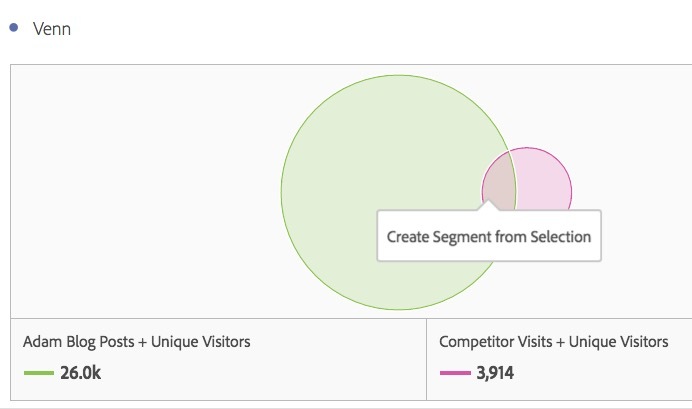 The first part is relatively easy, since I can build a segment to see which visitors view at least one of my blog posts. 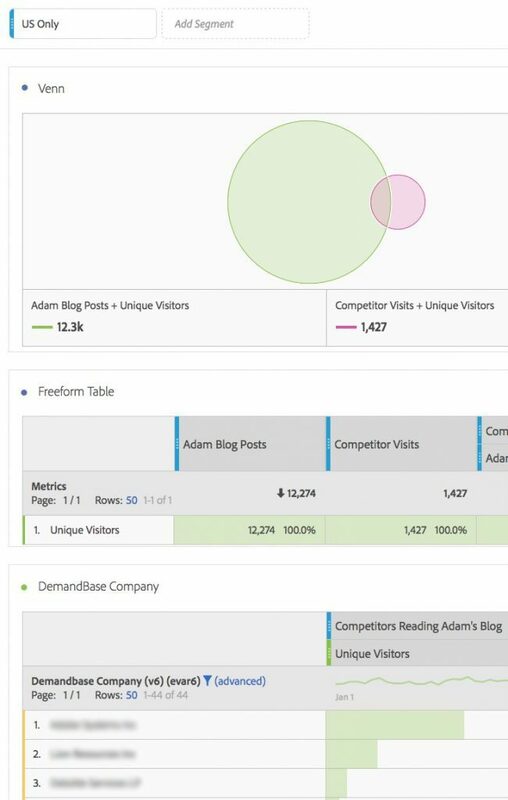 The latter requires me to use a tool like DemandBase to identify the companies hitting my blog and then SAINT Classifications to pick out companies that I think might be competitors of mine (or at least offer similar services to mine). This will limit all of the canvas visualizations to US Only data and all of the tables and Venn Diagram will instantly update! As you can see, the Venn Diagram visualization can be very powerful. Instead of creating hundreds of segments to identify interesting intersections, you can simply add them to the Venn Diagram visualization and then when you find the ones you like, create the segments right from there. 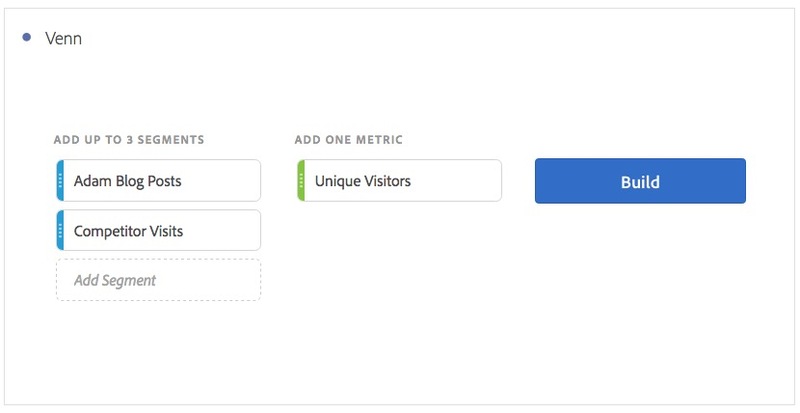 These segments can contain visitors who viewed products from Category A and Category B or visitors who viewed a video and purchased. The possibilities are truly endless. I recommend that you pick some of your favorite segments and try it out. I think you will have a much fun as I have had seeing the intersections of your data. Great post, Adam. I’ve been having a lot of fun experimenting with the Venn Diagram visualization for the last couple weeks, and the quick-segment creator for the intersecting data is really a great feature. Now I just need to clean up my segment manager… So many new segments! Hi Adam, I am having issues trying to understand what the cross over is between customers who shop on multiple devices. I was hoping I could show this through a Venn however I am having trouble with this. Any tips?